I remember looking at olive pitting systems as far back as 1995 when Pitted Kalamata Olives were relatively new. I was always fascinated why people actually bought Spanish Black Olives when, in my opinion, the Kalamata was so much tastier and juicier! I turned to my “Olive History Lesson” from my favourite olive book of all time “The History of the Olive in California” by Judith M Taylor. She explained that stuffed olives were developed by Spain in the 1950s as a way of entering the USA market, which was totally self-sufficient on whole green olives. They developed a system of filling the hole with a pimento (Capsicum) that would make the olive more ‘user friendly’ for Martinis. Taking a leaf out of the history books, we argued that if we could make a pitted kalamata more ‘user friendly’ we would generate interest in the product. At the time, Kalamata pitting systems were rudimentary at best. Many pitted kalamata had seeds or seed fragments in them, prompting some very angry customers to complain about this. The “HALF” was developed by the Italians, who wanted to have the shape and texture of a Kalamata without slicing it vertically. The new “Barchetta”, which means “Small Boat”, was born! Sandhurst trademarked this name in the early 2000s and it is still used extensively in Pizza markets and salad markets all over Australia. 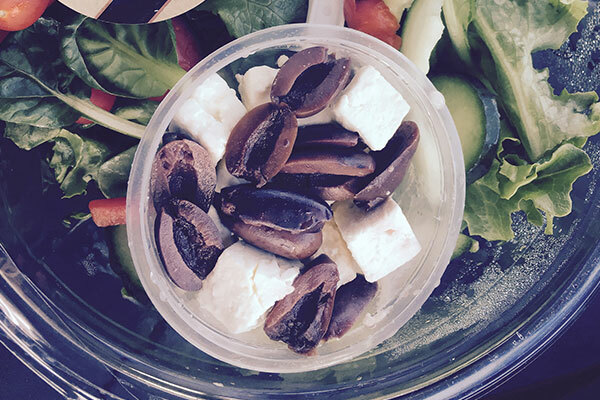 Here we see the product mixed with some cubed feta cheese and sold as a part of an instant Greek Salad Kit by one of our QLD customers. So, next time you see Olive “Halves, Splits or Wedges” think “Barchetta” instead!